Modern clubhouse with bars, catering, changing rooms & golf shop. Golf practice area including 9 hole par 3 course, driving range, chipping and putting greens. Situated on the outskirts of Harpenden, Redbourn Golf Club is a friendly golf club with some of the most comprehensive golf facilities in Hertfordshire (18 hole 'Ver' course; 9 hole par 3 'Kinsbourne course; driving range; short game practice area; modern clubhouse; fully stocked clubhouse). The Ver, an 18 hole 6,300 yard parkland course is reasonably open but a collection of trees, streams, out of bounds and bunkers add challenge to the course. The par 3 Kinsbourne course offers the opportunity to use every club in the bag and, unusually, provides a challenge to golfers of all abilities. Visitors are always welcome. I really liked Redbourn, but it was a terrible day to play it. Very strong wind mixed with rain and sleet. The scarified greens were a killer. In a 30 strong society 34 points won the day it was that tough! Many players just did not return cards. this was my worse round in a year or more but the conditions were not helpful. Would love to play it in the summer, I sure I could take 15 shots off my card. Staff and club house were superb they could not be more helpful, members even apologised for the weather!! Having never played it, I had read some reviews and was hoping to find a decent course. It was all that and more. The course was in really good condition, whether you are on the tees, fairways, or greens. The rough is very rough, but generally the fairways and first cut are very generous, so it takes a very wayward drive to find a huge amount of trouble. The course is just nicely laid out, with some lovely looking holes to be played. There are five par 4's over 400 yards, plus a par 5 that's over 600 yards, so not easy. The clubhouse is lovely, there are ample practise facilities, and I can't think of anything that I felt was even slightly disappointing. I really enjoyed my round here, and look forward to a return trip hopefully in the near future! 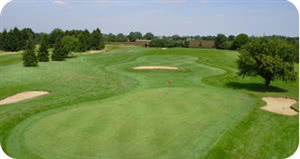 Redbourn Golf Club is a real treat to play nice course and nice clubhouse. Staff very friendly, members friendly, price very reasonable. This is a club I would join in a flash if only I lived closer... Ho Hum! Previous visits to Redbourn have had mixed reviews, and for a while there was no water in the hazards (which actually took something away from the course). However I am delighted to report that the water is back and now those hazards come into play - which returns this course into the 'Must Play' bracket. Parking close to the clubhouse is always a bonus as this is a popular spot for non-golfers. The usual friendly reception at clubhouse and pro-shop and locals. 50% reduction on rates here as TSG special offer and it is well worth the visit. Not sure if the bar is a spike bar I will have to ask next time.. There are some feature holes here and some that challenge the best, shots over water are fun... but not too difficult for most. Play within your capabilities and enjoy the scenery. Food is good, service with a smile, well worth a day out. The drive up to the clubhouse is a bit fiddly - so caution recommended, getting out onto the main road could take a while as that road is busy with fast-moving traffic. Good wide inviting fairways, interesting par 3s, well matured trees tended to get in the way. There appeared to be a fair amount of bunkers just perfectly positioned for me... I found a lot, escaped most (no light whispy sand here though). Take the time to enjoy the scenery, especially as Autumn brings the variation in colours, good layout I think it makes best use of the space. Take care when driving there, the turn off is easily missed and the approach road is twisty country track. Staff were charming, food was excellently prepared and delivered... Car parking, get there early to be closer to the First Tee otherwise it's a short walk. Course is not flat, buggies are available. We received a good TSG rate for midweek.